Etched in my mind are childhood memories of jostling a determined crowd to get a glimpse (jakhi) of Shivji Bawa, better known as Shreenathji, eight times* a day during my trips to Nathdwara, Rajasthan. I grew up in a devout vaishnav family and a yearly visit to this auspicious shrine town was a given. 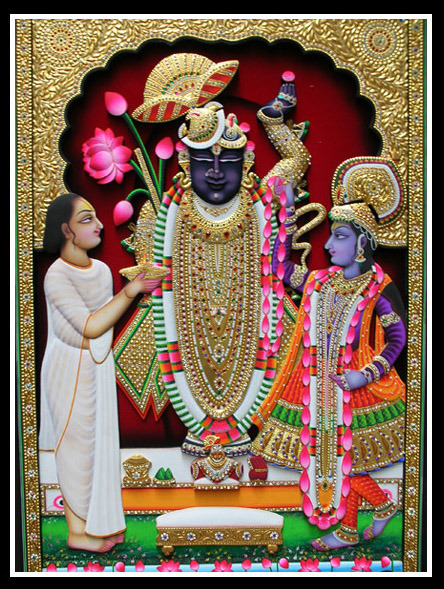 Shrinathji is a form of god Krishna manifest as a seven-year-old, specifically when he lifted Govardhan hill. Also fresh is the whiff of dung, fried savories and cardamom tea that trailed along the way to the haveli (temple) on the bustling, unpaved bazaar street. Everyday when walking to darshan my mother, aunts and all the kids would stop at various stores to examine the wares. A favorite haunt was chabiram’s pichwai store. Miniature hand paintings of every size were on display, some embedded with gold and semi-precious stones. Pichwai’s are a traditional art form depicting scenes from Lord Krishna’s life. 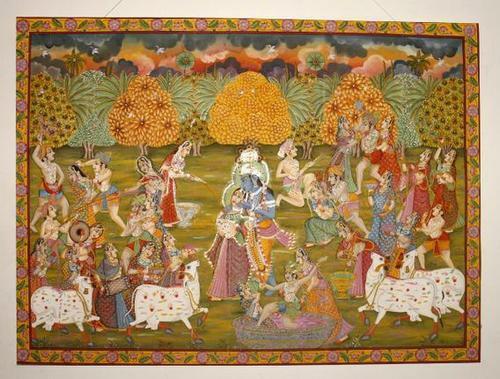 Most common among them are scenes of aRas Leela (dance) with Radha and other gopis or god Krishna grazing cattle. 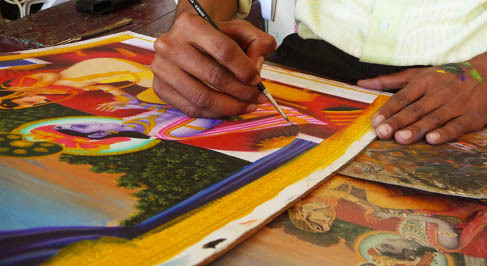 It was fascinating to watch the kaarigars’ steady hands paint a vivid picture with attention to the minutest details onto a plain piece of canvas. On returning home, my sister and I would spend days sketching and painting those scenes with obviously dismal results. Legend has it that gopis were so smitten by god Krishna that they would be at his mother Yashoda’s door at odd hours, finding an excuse to see him. Mother Yashoda was very protective of her darling child. Concerned that with the adoring gopis hanging around her house all day her darling child will never get any time to rest or play with his friends, she decided that all those who wish to visit her beloved son could do so after he had finished a snack or a meal and was resting before going out again. Taking this as a cue, the doors of the temple are left open for the people to catch a glimpse (“jakhi”) of the Lord eight times a day. Every time the doors open, god Krishna is dressed in different outfits based on the time of the day. Posted in Art, Artist, Crafts, Decor, Homes, People of India, Rituals and tagged art, Design, divine, god, India, Krishna, Painting, Pichwai, temples. Bookmark the permalink.